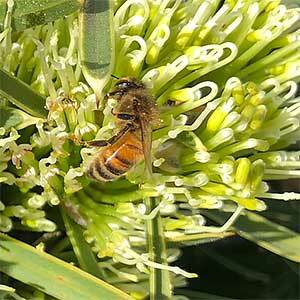 If you are looking for a plant to attract birds and bees to the garden from winter tp spring, Hakea corymbosa could well be the one. Commonly called the Cauliflower Hakea, the flowers are not striking, however they do appear in masses, they are fragrant and the plant makes a good dense hedge. It is a plant that makes a great habitat for small birds, and although it can reach 2 metres in height it is often only 1/2 this. Planted in a free draining soil and a sunny position and the Cauliflower Hakea requires very little care. Fertiliser in very poor soils only, and then with a low phosphate and low nitrogen fertiliser, as they do have a low nutrient required..
Propagation is usually from seed, cuttings can be taken however are difficult to establish. This is a plant that requires little to no pruning. You can lightly prune after flowering to tidy up if needed.